According to the Urban Dictionary, a "crazy cat" is someone who does extraordinary things, out-of-the-norm things. Or, in our opinion, fabulously mad things. Crazycat is a platform that was started by three young women who wanted a space where others could go to for advice, business opportunities and just good ol' stories; stories about and for the everyday woman. Its recent launch event entitled, “Letting Your Light Shine” on 30 April was a hit, which its founders were nicely surprised by; there was a lot of love going around that day at the School of the Arts (SOTA). The event started with a talk by Noor Tagouri, an American journalist, activist, global motivational speaker and documentary filmmaker who made history by becoming the first hijabi reporter on commercial US television. 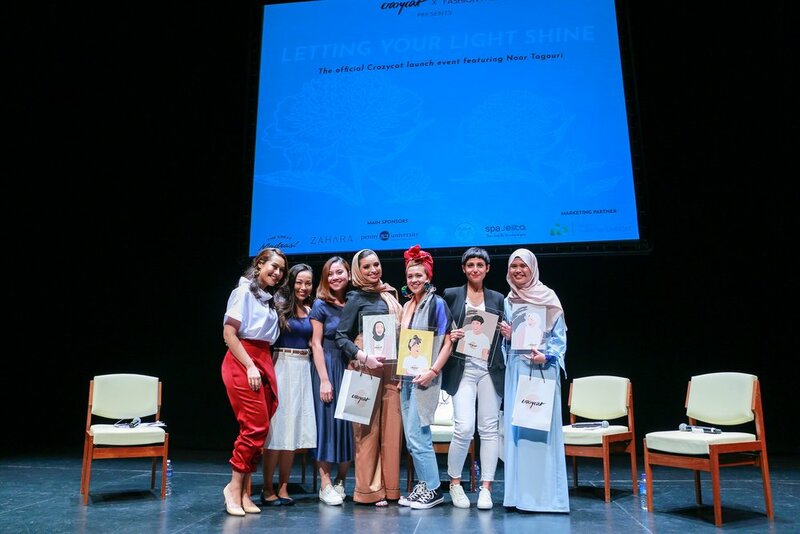 Tagouri's talk was followed by a panel discussion with TV presenter and speaker Anita Kapoor, writer and entrepreneur Aida Azlin, and musician Aarika Lee. The conversations revolved around the speakers’ personal journeys of discovery, how they found their light and how they let that light shine. Photo: Crazycat. Left to right: Crazycat ladies - Sarah Bagharib, Cheryl Guzman Ng, Hannah Kamsadi - Noor Tagouri, Aarika Lee, Anita Kapoor, Aida Azlin. In our latest podcast, Mackerel chats with the three ladies who started Crazycat - Sarah Bagharib (founder), Cheryl Guzman Ng (co-founder) and Hannah Kamsadi (lead creative) - and we ask them about the story behind this not-so-everyday venture and what other crazy cats can look forward to. Photo: Crazycat. Left to right - Hannah Kamsadi, Cheryl Guzman Ng, Sarah Bagharib.